Here is another old Almark sheet. 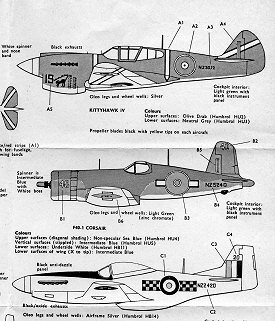 Time period unknown, but it has to be pretty old as Frog and Airfix kits are the recommended ones with many modifications having to be done to the P-40 to make the long-tailed 'M' variant. All of those fixes are clearly spelled out in the instructions and have you using balsa wood to do the tail extension, something I don't think many of have done in the past 25 years. 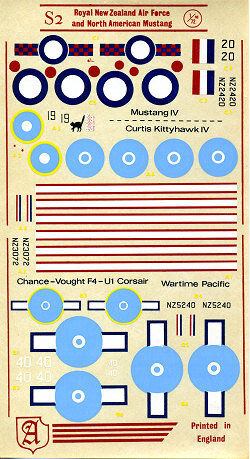 Next is F4U-1D in the Tricolor scheme. The drawing of the wing shows it clipped, but I think RNZAF Corsairs were ex-USN/USMC so would have full tips. Unit is unknown. Finally a postwar P-51D Mustang IV of 3 Squadron in 1948. Decals are fair and I'm thinking that perhaps the blue on the wartime roundels is too light. Oddly the post-War Mustang markings seem to have been given another coat or two of clear as they are quite glossy. I noticed that the yellow surround to the Coraisr and Kittyhawk markings is not only rather transparent, but on the Corsair, it seems too far out from the rest of the roundel.